Maxim Bogdanovich's Literary Museum is one of the most beautiful museums of the Belarusian capital. It is housed in a two-storey brick building, a monument of the city architecture of the 19th century in the Troitskoye suburb, on the bank of the River Svisloch. Unfortunately, the house, where the writer was born, was demolished during the war, that's why the literary museum is situated not far from the place, in another building.A decree on the foundation of Maxim Bogdanovich's Literary Museum was ruled in 1981. 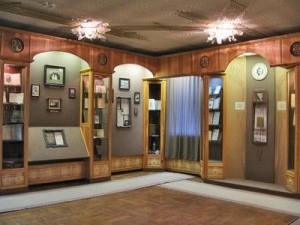 Thanks to the enthusiasm of the artists and decorators, the museum was opened to the public in 1991, by the centenary of Bogdanovich's birth.In the museum you can plunge in the unique poetic atmosphere of the house and learn some interesting facts about the life of the famous Belarusian writer.